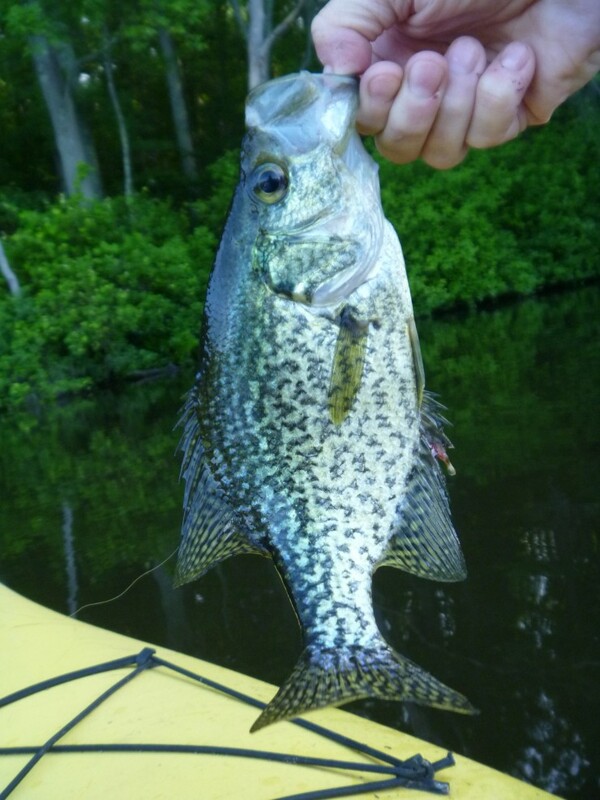 Decided to take the kayak to the local pond for a quick Memorial Day trip. Within 10 minutes of leaving my house, I was on the water and making the first cast. My setup is still pretty simple: Kayak, rod, reel, lifejacket, flat fly box, and paddle. I rig up at the car, stow the paddle and fly box in the kayak, and head to the water with the kayak in one hand and the fly rod in the other. 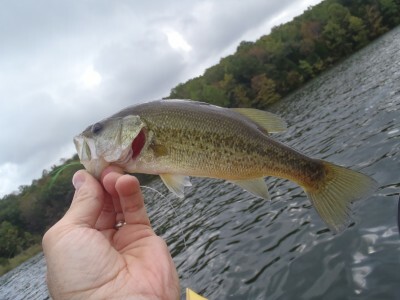 It had been a warm day and temps were dropping into the low 70’s with a light breeze, perfect for some warmwater top action. I decided to tie on a yellow Booglebug. I used it for the entire evening. It did not disappoint. Here are just a few of the trophies caught during my evening paddle. 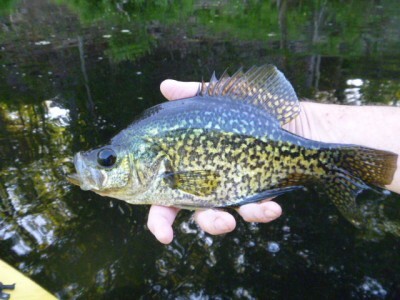 There were a number of nice crappie and bream landed, many were bigger than my hand. 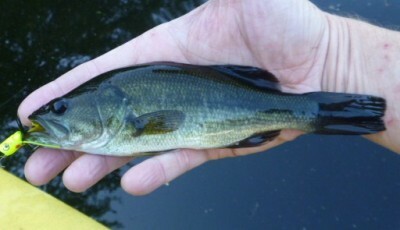 And there was also a bass, the first I have pulled from this spot. As luck would have it, there was one other craft on the water. A couple was casting spinner baits from a v-hull aluminum boat. After I had caught a few fish, I overheard the woman whisper to her companion in a tone of disbelief, “He’s just taking pictures of them and putting them back in the water.” I’m guessing that they were there to catch dinner. I’m not against eating what you catch, but given that this pond sits behind a light industrial complex, one should be cautious about what is consumed from this water. Hope you had a chance to get out as well. Enjoy! May is still deciding if it will yield to spring, alternating between 70-degree days and 30-degree nights. Today it rained off and on, only adding to the confusion. After a day indoors, I needed an outside adventure. This evening I had just enough time before dark to make it down to the local pond for a few casts. I took along my latest fiberglass build because of the way it casts small poppers from the bank. The action is slower and the presentation is delicate enough not to spook the fish. On glassy water like this, delivery and retrieve speed are key. I only caught two fish, but it was worth the trip. 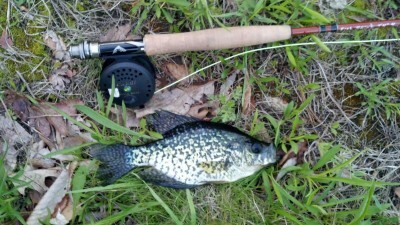 The first was a small bream, but the second was a nice crappie that strongly resisted and worked the rod all the way to the bank. After I placed him in the water, I headed for the path over the hill that takes me back to relative civilization. For some reason, the walk back always seems longer than the time to get there. Some nights a spare hour is all it takes to make the day. Enjoy! For the past few weeks I’ve been eyeing the narrow pond that lies behind a nearby industrial park. Sandwiched between an office complex and the state highway, it is heavily shaded on one side by pine trees rising above the steep landscape and relatively open on the other side due to clearing from residential development. Well worn paths weave among the trees, yet I had never seen anyone in the general area. Having a couple of hours to spare, I decided to wander down with a 9′ 5 wt and some poppers to see what I might find. Tying on an orange popper that resembled a small safety cone, the first casts yielded a few bumps but no takers. 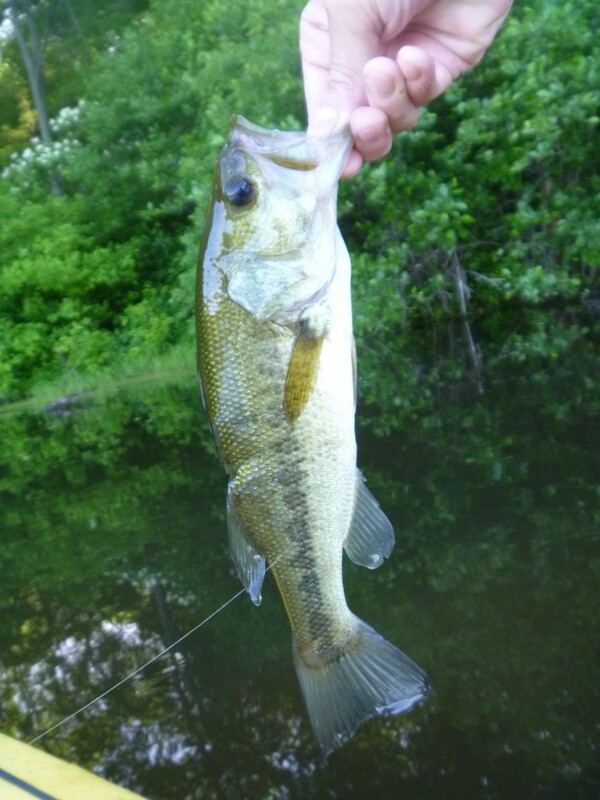 I relocated to an area where fallen trees partitioned a 20′ section of the pond and changed to a black popper with white rubber legs. From the shore, I methodically delivered a series of casts, each a few feet farther than the last, moving back and forth until I had covered the entire area. After the popper landed, I would allow it to rest for a few seconds until employing short twitches in no particular pattern. After tossing it between two branches that were jutting about a foot out of the water, I felt a strong tug followed by a series of short splashy resistant jumps. 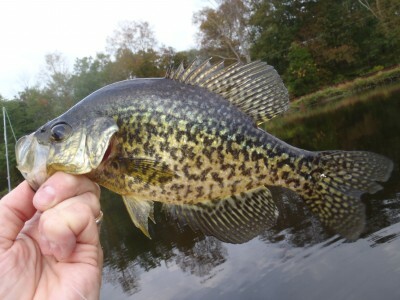 Initially I thought it was a small bass, but the distinct black and silver-green coloring, along with markings that resemble digital camo, told me I had landed something equally desirable – a black crappie. 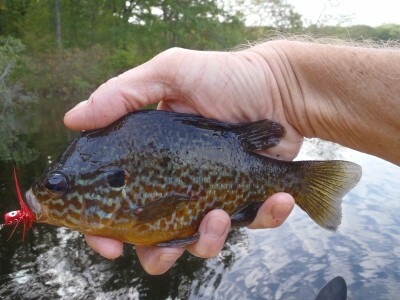 I have not seen a crappie since leaving New Jersey, and could not remember ever catching one in Connecticut. Compared to others I had landed in the past, this was rather large, somewhere between 10″ and 12″. It was also the biggest fish of the day. The pre-dusk sun showcased its spectrum of colors. 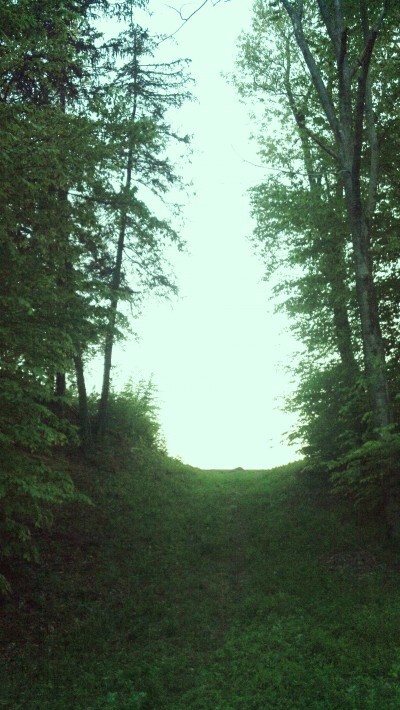 Unfortunately my phone camera could not recreate its beauty. 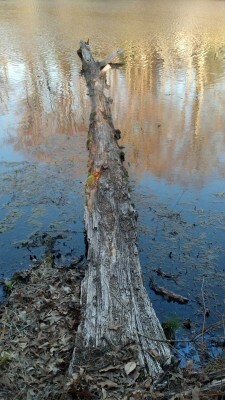 Moving along the bank I found a fallen tree that would act as my casting platform for the remainder of the day. It was also the most productive area for this trip. This had been a sizeable tree, measuring 2 feet in diameter at the base, and undoubtedly kept a beaver busy for quite some time before making what I am sure was a giant splash. 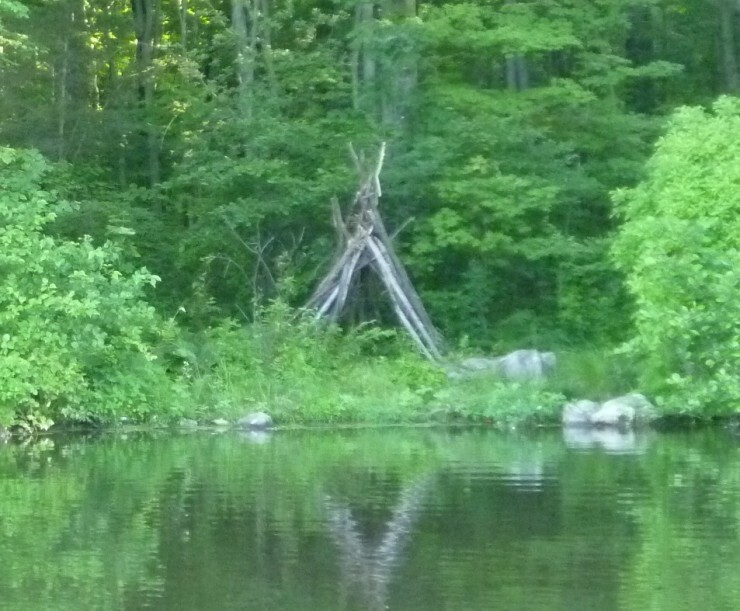 A portion of the stump remained attached, providing much-needed stability. Almost 40 feet of the trunk lay partially submerged in the water. Based on the substantial wear and decay, many others have cast a line from this same spot. I tied on a small red popper and walked out slowly to the middle of the log, stopping only when my balance became questionable. It was at this point I remembered that the phone was not in its waterproof case. The prospect of losing my balance and the resulting dunking could be both expensive and inconvenient, not to mention embarrassing. With the sun setting, I decided to take a couple of steps back towards shore as an added precaution. Sending out the first cast, the search began. Although I had seen fish on the right side of the log, they quickly disappeared and I had no luck, despite repeated attempts. The left side was another story. 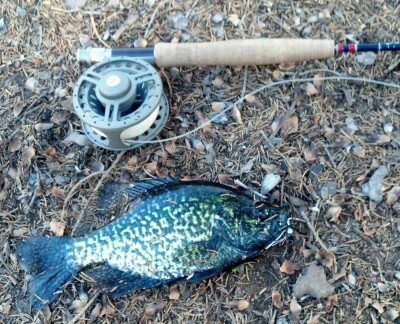 Well shaded and somewhat murky, it held a pod of crappie. Several casts drawn along side the trunk were met with strikes, and a few fish were brought to hand. Sensing that sunset was close at hand, I backed down the trunk to the relative safety of the steep bank and began my trek to the car. Passing two teen-aged boys with spinning gear, we briefly traded tips. 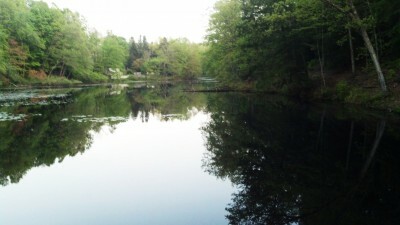 They informed me that this is primarily a bass lake, which only fuels my desire to return. Enjoy! I’m lucky enough to live in an area that has a number of fishable lakes and ponds. Some do not allow gas powered motors, and as a result, get little fishing pressure. So when the rivers become blown out from all the rain we’ve had recently, I load up the kayak, bass rod and warm water fly box and head out for the day. 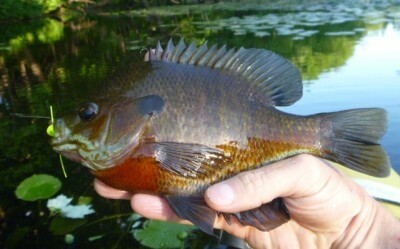 Fall is a great time to fly fish for warm water species. Poppers are very effective, especially smaller ones with rubber legs. 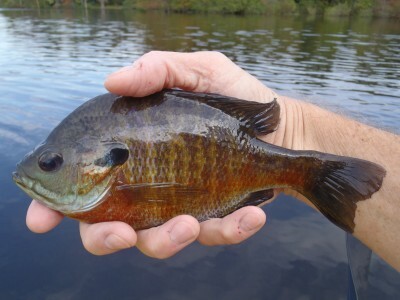 The fish seem to adopt the color palette of autumn and are eager to take a fly. Here are some pics from the local lakes. Enjoy!